All of the 13 airlines currently flying the Airbus A380 use aircraft with a three-class configuration, featuring First-, Business- and Economy-class cabins. The world’s largest operator of the superjumbo is planning to change that with the introduction of a two-class A380 later this year. Emirates is launching a daily service from Dubai to Copenhagen in December, using what it says is the world’s first two-class configured A380, which can carry up to 615 passengers. But the down side is the new A380 will not have a First-Class cabin. Instead, it will have 58 seats in the Business Class and 557 in the Economy Class. Emirates began flying to the Danish capital about four years ago, using an Airbus A330. A few months later, the airline switched to the bigger Boeing 777. Tim Clark and Thomas Woldbye announce the A380 service. “Today, based on strong load factors, we are happy to further up-gauge the route to our iconic double-decker, the A380,” said president Tim Clark. As of December, the airline will offer more than 8,600 seats a week between Copenhagen and Dubai. Emirates also noted that the aircraft would be more environmentally efficient than others, producing the lowest CO2 emissions per passenger kilometre of all commercial airplanes. “Emirates is making history with this aircraft, its fuel efficiency is better than most modern small passenger cars in terms of fuel economy per passenger kilometre, allowing us to reduce emissions without compromising on comfort,” said Clark. Meanwhile, the airport says it is investing heavily to make its infrastructure A380-compatible. Copenhagen will be the first in Scandinavia to offer a scheduled A380 service. “The increased capacity will hopefully stimulate more trade and tourism between Denmark and countries of the Middle East, Asia and Africa,” said Thomas Woldbye, CEO of Copenhagen Airports. Emirates has 59 A380s in its fleet, operating from Dubai to more than 30 destinations worldwide. The airline has ordered a total of 140 superjumbos. 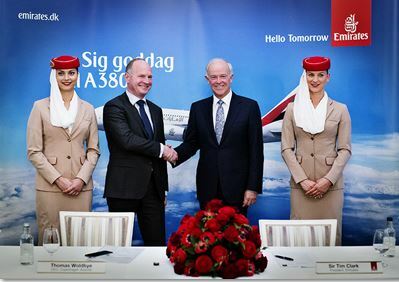 Images are courtesy of Emirates and Copenhagen Airport.